Background: Breast cancer is one of the most common women’s cancers, and the number of cases is increasing worldwide. Objective: The current study compared invasive lobular carcinoma (ILC) and invasive ductal carcinoma with regard to the prevalence of estrogen receptor (ER), progesterone receptor (PR), and age prevalence. Methods: This cross-sectional study recruited 225 women diagnosed with invasive ductal or lobular carcinoma who were admitted to the Department of Surgery of Baqiyatallah hospital between March 2014 and March 2015. The ER and PR levels reported were based on the pathologists’ interpretation of assay results; both ER and PR were estimated to be positive when immunoperoxidase staining of the tumor cell nucleus was more than 10%. Results: The most common malignancy was invasive ductal carcinoma found in 213 patients (94.7%) with a mean age of 49.30 ± 12.25 years (0.706). The most common subtype of invasive ductal carcinoma was NOS (82.6%); patients of this type had a mean age of 49.68 ± 12.27 years. Among patients with infiltrative ductal carcinoma (IDC), 129 (60.6%) of them were ER positive. In patients with ILC, 11 cases (91.7%) were ER positive (P < 0.03). Among the patients who had IDC, 107 (50.2%) of them were PR positive. Also, 6 patients who had ILC (50.0%) were ER positive (P < 0.98). Conclusion: The results of this study indicate that the age prevalence of breast cancer in Iran is about 10 years sooner than the rest of the world. In addition, the prevalence rates of positive estrogen and progesterone receptors were lower in this study than in the majority of other studies, and these 2 features worsen the prognosis in the treatment of Iranian patients. Pal SK, Lau SK, Kruper L, et al. Papillary carcinoma of the breast: an overview. Breast Cancer Res Treat. 2010;122(3):637-645. doi: 10.1007/s10549-010-0961-5. Yau C, Fedele V, Roydasgupta R, et al. Aging impacts transcriptomes but not genomes of hormone-dependent breast cancers. Breast Cancer Res. 2007;9(5):R59. doi: 10.1186/bcr1765. Arpino G, Weiss H, Lee AV, et al. Estrogen receptor-positive, progesterone receptor-negative breast cancer: association with growth factor receptor expression and tamoxifen resistance. J Natl Cancer Inst. 2005;97:1254-1261. doi: 10.1093/jnci/dji249. Cui X, Zhang P, Deng W, et al. Insulin-like growth factor-I inhibits progesterone receptor expression in breast cancer cells via the phosphatidylinositol 3-kinase/Akt/mammalian target of rapamycin pathway: progesterone receptor as a potential indicator of growth factor activity in breast cancer. Mol Endocrinol. 2003;17:575-588. doi: 10.1210/me.2002-0318. Cui X, Schiff R, Arpino G, Osborne CK, Lee AV. Biology of progesterone receptor loss in breast cancer and its implications for endocrine therapy. J Clin Oncol. 2005;23:7721-7735. doi: 10.1200/JCO.2005.09.004. Kim H-J, Cui X, Hilsenbeck SG, Lee AV. Progesterone receptor loss correlates with human epidermal growth factor receptor 2 overexpression in estrogen receptor- -positive breast cancer. Clin Cancer Res. 2006;12:1013s-1018s. doi: 10.1158/1078-0432.CCR-05-2128. Bauer KR, Brown M, Cress RD, Parise CA, Caggiano V. Descriptive analysis of estrogen receptor (ER)- negative, progesterone receptor (PR)-negative, and HER2-negative invasive breast cancer, the so-called triple-negative phenotype a population-based study from the California Cancer Registry. Cancer. 2007;109(9):1721-1728. doi: 10.1002/cncr.22618. Dunnwald LK, Rossing MA, Li CI. Hormone receptor status, tumor characteristics, and prognosis: a prospective cohort of breast cancer patients. Breast Cancer Res. 2007 J;9(1):R6. Fisher B, Redmond C, Fisher ER, Caplan R. Relative worth of estrogen or progesterone receptor and pathologic characteristics of differentiation as indicators of prognosis in node negative breast cancer patients: findings from National Surgical Adjuvant Breast and Bowel Project Protocol B-06. J Clin Oncol. 1988;6(7):1076-87. doi: 10.1200/JCO.1988.6.7.1076. Buzdar AU, Ibrahim NK, Francis D, et al. Significantly higher pathologic complete remission rate after neoadjuvant therapy with trastuzumab, paclitaxel, and epirubicin chemotherapy: results of a randomized trial in human epidermal growth factor receptor 2–positive operable breast cancer. J Clin Oncol. 2005;23(16):3676-3685. doi: 10.1200/JCO.2005.07.032. Hugh J, Hanson J, Cheang MC, et al. Breast cancer subtypes and response to docetaxel in node-positive breast cancer: use of an immunohistochemical definition in the BCIRG 001 trial. J Clin Oncol. 2009;27(8):1168-1176. doi: 10.1200/JCO.2008.18.1024. McPherson K, Steel C, Dixon JM. Breast cancer-epidemiology, risk factors, and genetics. BMJ. 2000;321(7261):624. doi: 10.1136/bmj.321.7261.624. Mousavi SM, Montazeri A, Mohagheghi MA, Jet al. Breast cancer in Iran: an epidemiological review. Breast J. 2007;13(4):383-391. doi: 10.1111/j.1524-4741.2007.00446.x. Mousavi SM, Mofid B, Mohebi HA, et al. Comparison of local recurrence, metastasis and survival rate between the two surgical approaches in clinical stage I and II breast cancer (Persian). Journal of Medical Kosar. 2009;14(2);89-94. 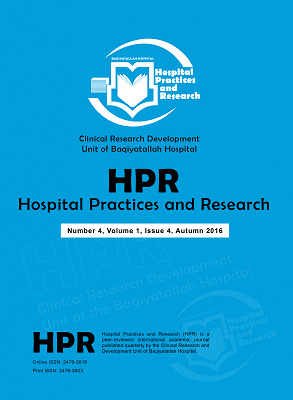 Moghni M, Mokhtariyan K. Correlations of estrogen or progesterone receptors with grade of invasive ductal carcinomas of the breast in women referred to pathology center in Chaharmahal va Bakhtiari province Iran (Persian). J Shahrekord Univ Med Sci. 2009;11(3):40-45.